Natasha - So these creatures are called tree crickets, they're about a centimetre in length. They're really beautiful. I mean most of us see crickets from the pet store which look kind of brown and a bit cockroach-like tree crickets are really pretty. They have translucent wings, have long antennae, they're small green things and there's tree cricket species more or less all over the world. The ones that we're working on come from India. All tree crickets do this really amazing thing which is that they sing to attract mates. They put up their wings which are resonant, rub them together, set them into vibration and produce really beautiful tonal sounds. That's what you can hear most summer nights. These sounds are heard by the females who can use them to identify males of their own species from other males and find the males. These tree crickets also do this amazing other thing which is that they make an aid that helps them be louder than they would be on their own. Chris - Really what do they do? Natasha - They make a thing called a baffle. 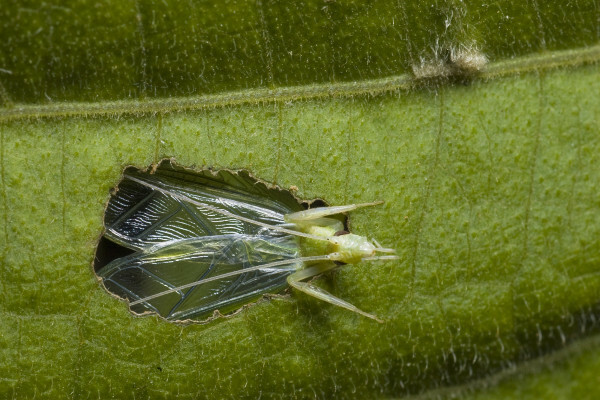 A baffle is, for a tree cricket, very simply a hole cut in a leaf that they sing from, so they place their wings directly against this hole and seeing from inside it. And this makes them louder. Chris - Is that a bit like, you see people walking around in the old days on Hollywood sets with a megaphone which was basically a cone with the end chopped off and they shout into it. Is it sort of doing something similar they're creating an amplifier from a leaf to make themselves louder? Natasha - It's a bit similar. So I'll try and explain the physics as simply as I can. So if you can imagine the wings as a board that's vibrating back and forth. Every time the board moves forward it produces high pressure in front of it. And behind it, it produces low pressure and this is essentially what sound is, it's changes in pressure. What will happen is that the high pressure and the low pressure will meet at the edge of the board and when they meet with each other they'll cancel each other out. This is something we call acousic short-circuiting. Now the smaller the board is, the more of the sound that's produced is short circuited. If you can somehow prevent these two high pressure and the low pressure from meeting each other than you can prevent acoustic short-circuiting. And the more you can do this the more loud the sound will be. And that's essentially what's happening when a cricket puts itself in the hole in a leaf. What happens is that the front face of the wing is effectively acoustically separated from the back face of the wing and they end up being louder. Chris - And how does the cricket find the leaf and the hole in the first place? Natasha - There's a big secret in that. So one of the things that we did was to see whether there are different baffle designs. So basically, you know, what are the different sizes of leaves that are available to the cricket? What are the different sizes of holes they can make? Where do they put the hole? And it turned out if you model this you find that some baffles perform a lot better than others and the baffle that performs the best is made with the largest leaf, with a hole that's exactly the size of the wings and placed dead centre in the leaf. Chris - Right, so next question then, given that that's the optimal solution, what proportion of the crickets actually opt for that? In other words are they actively pursuing that solution or do they arrive at that sometimes by chance? Natasha - Well it depends on the situation. But when we did an experiment in which we gave 19 crickets the choice between a small leaf which wouldn't make such a good baffle, and a large leaf which would make a great baffle, 15 crickets made a baffle and every single one of them made a baffle in the large leaf. They made a baffle in the large leaf, with the optimally sized hole and they got pretty close to the centre so all of the Crickets seemed to know how to make an optimal baffle. Chris - Now given that crickets sing at night, they're therefore able to work out the size of a leaf, discriminate between leaves that are bigger and smaller, and then having worked out the size of the leaf and made a choice, they're then working out where the middle is. How on earth are they doing that? Natasha - That's, yeah, they are doing that. We have no idea. There may be different ways in which they're doing this. One is to walk along the edge of the leaf. The other is to use these really beautiful long antennae that they have to touch the edges of the leaf to see if the edges are further away on one leaf than another one, and you know, sort of using them to centre themselves in the middle of the leaf. But to be honest the answer is we don't know how they're doing it yet. Chris - And now that you've done these experiments and you can actually make the measurements, the sounds they're producing. How much louder is the baffled cricket compared with a non-baffled cricket. In other words what sort of advantage, a sonic advantage, do they gain through doing this? Natasha - So between a cricket that singing on its own and one in an optimal baffle there's a four times change. So a cricket that's in an optimal baffle will be four times as loud as a cricket that's on its own. Chris - This completely changes our view of insects doesn't it? Because we mostly think of insects as sort of dumb automatons with a brain that's, sort of, hardwired to process inputs and generate outputs. But here you've got very simple organisms, they're making a sequence of decisions informed by their own measurements in order to achieve an outcome and that's really quite striking! Natasha - Absolutely. It has been a long-held view that invertebrates are stereotyped, and vertebrates, mammals, birds, etc. are extremely clever and we've been having to change this view. I mean I think one of the first things that really jolted this was when they found that octopuses can make tools, they were making all sorts of tools. Now if you think about it a little bit an octopus is a mollusc. It's the same as a snail. So really, we can't hold on to this idea anymore that invertebrates are simpler animals, they're just different from us and we're absolutely going to have to look very closely at how insects behave in order to be able to appreciate what's going on that's not immediately apparent on the surface. Are crickets crusading for Christ in the Bible Belt or what? Two-spotted crickets use Magnolia Tree leaves as parabolic reflectors to amplify and focus their mating calls, thrilling so loudly in the Mississippi Bible Belt that folk around here may say they are crusading for Christ. Of course since the invasion of kudzu vines, the tree crickets are also are using kudzu vine leaves, chewing holes in the center of the leaves, baffles if you will. I have studied this behavior in the field, making photographs and videos. It is quite remarkable behavior! The question is, did crickets evolve in association with Magnolia Tree leaves using them as parabolic reflectors, often perching between two leaves... then later learn how to chew holes in other leaves like kudzu... or did the process evolve the other way around? I observed this behavior first with two-spotted cricket, Neoxabea bipanctata (Da Geer 1773) on Magnolia Tree leaves which are more ancient than kudzu. I would love to collaborate with Natasha Mhatre, or others. You may want to note that tree crickets do NOT chew holes in the Magnolia Tree Leaves; but their mating calls are amplified and directed simply given the large curled size of the leaves themselves which is why I refer to this a using leaves like parabolic reflectors. I believe tree crickets first used Magnolia Trees and later evolved to use other leaves, chewing holes in them so they will have a place to perch and put their two front legs on the leaves, given this is where their ears are located. Thus the crickets can feel the sound vibrations which other crickets are calling and come to synchronize their calls. They do this in giant Magnolia Trees, much like fireflies use mangrove trees to congregate upon. Plus by chewing upon leaves they can then call and eat at the same time, thus powering their calls which expends a lot of energy. Do you know how many calories a cricket uses over the course of an evening calling? Do you know how many tree crickets may synchronize their call and gather in mass upon a single great Magnolia Tree? Do you know how to calculate the area of the leaves and the density of crickets necessary to establish synchronized calling? Perhaps Natasha, you might email me at terrylynch@aol.com. I am a naturalist/photographer. I met the cricket expert T.J. Walker at U of F. Dr. Lloyd introduced me when I was there. <Personal fundraising promotion removed> This is very important! In fact, I think supporting Natural Science research and discovery is one of the best ways people everywhere should be investing their money... for unless this is none our children's children may never hear the call of tree crickets, cicada, or see fireflies.